Black Friday is fast approaching and you know what that means…great camera deals! 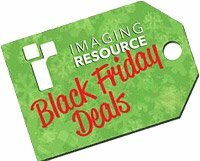 We have been compiling them on our "Black Friday Camera Deals for 2016" page, but we realize that there are a lot of deals to keep track of, so we are starting a daily round-up of some of the standout deals. Before we get to the deals, we want to make mention of a special promotion we have with B&H. In addition to the 2% to 4% reward points on certain purchases at B&H, any purchase you make with them through our affiliate links automatically enters you into a monthly drawing for a $500 gift card. All B&H links on our Black Friday Deals page are marked with a special gift card icon to help you spot them. If you want to get started with a Canon mirrorless camera kit, the Canon EOS M3 is available in a kit with an 18-55mm lens and an electronic viewfinder accessory for $828, which is a savings of over $500. If you're looking for a Canon DSLR instead, then how about the T6i DSLR? You can get everything you need to start capturing, and printing, photos with an 18-55mm lens, PRO-100 printer and much more for $837.92 after a mail-in rebate compared to its regular price of $1,373. Get your hands on a Fuji X-T10 and a pair of lenses for under $900! Are you a Fuji fan? Instantly save $400 on a Fujifilm X-T10 with 16-50mm and 50-230mm lenses. Available for $899 in black and silver. Micro Four Thirds shooters take note; you can purchase the Panasonic G7 can be acquired this week with a 14-42mm kit lens for $500, a savings of $300. Plus, you get a $50 gift card! Get the black one here and the silver one here. Nikon has been heavily targeting sports and wildlife shooters with its excellent D500 DSLR. That is more evident now that they are offering a special kit that includes the D500 and Nikon 200-500mm f/5.6E lens. For Black Friday, you can purchase this kit, which includes a battery grip and XQD cards, for under $3,250. That's a lot of kit for the money. Do you want some wide glass to go with that D500? You can purchase a Sigma 18-300mm lens (including a free close-up lens filter and Sigma USB dock) for $499, an instant savings of $80. This lens is also available on sale for the following mounts: Canon, Pentax and Sony A.
Nikon wants to give you lots of reach with their D500 Sports and Wildlife kit. The Sony A6000 with 16-50mm and 55-210mm lenses, plus a free accessory bundle, can be purchased for just under $700, an instant savings of $350. To help stabilize your camera when recording video, the DJI Ronin-M is a solid option. Today only, B&H is selling the Ronin-M for $1,199, an instant savings of $200. If you've been looking for a good deal on a 3-axis gimbal, strike while the iron is hot. It's always fun to print your own photos and you can grab the Epson P800 printer for $300 off after a mail-in rebate until November 30, which results in a final price just under $900. Grab some paper to go with it too, it's on sale. If you're curious to learn more about this printer, read our Epson P800 printer review. It's very satisfying to print your own work. You can purchase the P800 printer for under $900 after completing a $300 mail-in rebate. If you want to try out different glass for your gear without buying it right now, Borrow Lenses has a Black Friday promotion that grants you 20% off all rentals with the code "BF2016." Plus, if your rental includes Thanksgiving and Black Friday, you get those two days for free! Check it out here. That's it for today. Be sure to check out our page with all the deals and come back tomorrow to see what we add to it!